Our product range includes a wide range of 360 series image-based barcode readers, barcode reader 470 series and esd-safe barcode readers. When high-performance, flexibility and ease of use are essential for your barcode reading application, the DataMan 360 series delivers. The DataMan 360 series reads a wide range of 1-D linear and 2-D matrix symbologies. Powerful ImageMax technology with a high powered liquid lens and a high-powered illumination enhances image formation and maximizes read rates for even the most challenging dot-peen or laser marked DPM codes. 1DMax® is a 1-D barcode reading algorithm optimized for omnidirectional barcode reading. Hotbars II technology locates, extracts and decodes low-resolution 1-D barcodes quickly and accurately. Combining these two powerful technologies offers extraordinary read rates at very high speeds. 2DMax provides reliable 2-D code reading despite code quality, printing method or the surface that the codes are marked on. Patent pending PowerGrid technology locates and reads 2-D codes that exhibit significant damage to or complete elimination of the finder pattern, clocking pattern, or quiet zone. These combined technologies provide increased read rates and decoding robustness for the most difficult and degraded codes. ImageMax technology is specifically designed to read challenging DPM codes on a variety of round, reflective or specular surfaces using a combination of cross polarized and co-linear polarized LEDs and a high powered lens with liquid lens technology. ImageMax technology auto-focuses to read small codes at variable working distances and provides even illumination to reliably read hard to read DPM codes. The one-piece, ESD-safe metal housing simplifies installation and prevents equipment damage. DataMan 8050HD/8050HDX corded handheld barcode readers are designed with advanced algorithms to decode challenging 2D direct part mark (DPM) codes as well as 1D barcodes. The ESD protective and rugged housing ensure ESD safety in even the harshest industrial environments. 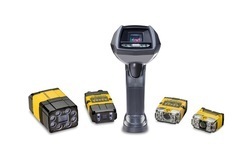 DataMan fixed-mount barcode readers feature best-in-class performance with patented 1D and 2D code reading algorithms to read even the most challenging and degraded codes, in addition to flexible optics and lighting. They are easy to setup and quick to deploy on your production line. Looking for Barcode Reader ?